If you can believe it, Port Huron got their fourth shot at UHL hockey after the Flags folded....sort of. By now, the UHL was really starting to fall apart, having lost over a dozen teams in two seasons. The remaining owners, led by the Franke family of Fort Wayne, reorganized as the IHL, dropping the UHL history and trophies in favor of the records, history and trophies of the original IHL (which folded in 2001). After the Flags folded, the league granted another expansion franchise to Port Huron for the 2007-08 season. The team would be called the Icehawks and would be owned by Frank and Larry Kinney. They retained coach Stan Drulia for the upcoming season. 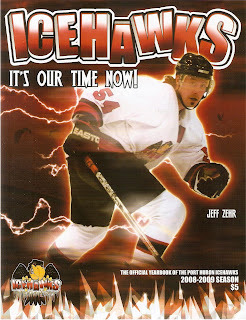 I was a big Icehawks fan during their three years in Port Huron, and went to several games each year. They really didn't have programs for sale like the previous teams, opting instead for the cheaper roster printouts or four-page booklets. They did have yearbooks in their final two seasons (why they didn't sell them at the gate instead of in the Pro Shop, I have no idea), and I made sure to buy them. Here are some scans. Expectations were rather low for the Icehawks in 2007-08. They were the fourth team in Port Huron since 2002, and the city was considered burnt out by shady owners, poor hockey teams and instability. Many people (me included) thought that Port Huron was added to the IHL just to give the league the necessary six teams to meet work visa requirements and would be history after one year. A late start to marketing didn't help, either. However, coach Stan Drulia quietly put together a strong team. The Icehawks eventually finished in second place, with a solid 41-29-6 record, 32 points behind first place Fort Wayne. Attendance dropped significantly for the Icehawks, as they averaged a league-worst 1344 per game. Rookie Tab Lardner led the Icehawks in scoring that season, netting 39 goals and 81 points on his way to Rookie of the Year. Jamie Carroll and Jeff Zehr joined him in the 30-goal group, and Flags holdover Kris Vernarsky netted 21. As a group, the Icehawks scored 241 goals. The Icehawks were even better in net. They started the season with Marty Magers and Ron Vogel. While they were dependable, the Icehawks got a big boost by the arrival of Larry Sterling from the CHL. Sterling took over the top spot and had an excellent season, going 24-14-3 with a 2.51 GAA and 1 shutout. As a group, the Icehawks allowed 230 goals, second-lowest in the league. The Icehawks really came together in the playoffs. In Round One, they faced Flint, and easily knocked off the Generals in five games to reach the Turner Cup Finals. This was the first time a Port Huron hockey team had reached a finals series since 1977-78, and their opponent would not be an easy one. The Icehawks faced the Komets, who had dominated the league and went 56-12-8. Most expected the Icehawks to simply show up for the minimum amount of games and watch the Komets skate off with the Turner Cup. However, the series was a thriller, as Port Huron jumped out to a 3-1 lead before the Komets rebounded to win it in seven. Game 7 was a heartbreaker, as the Komets took the Cup in triple OT. 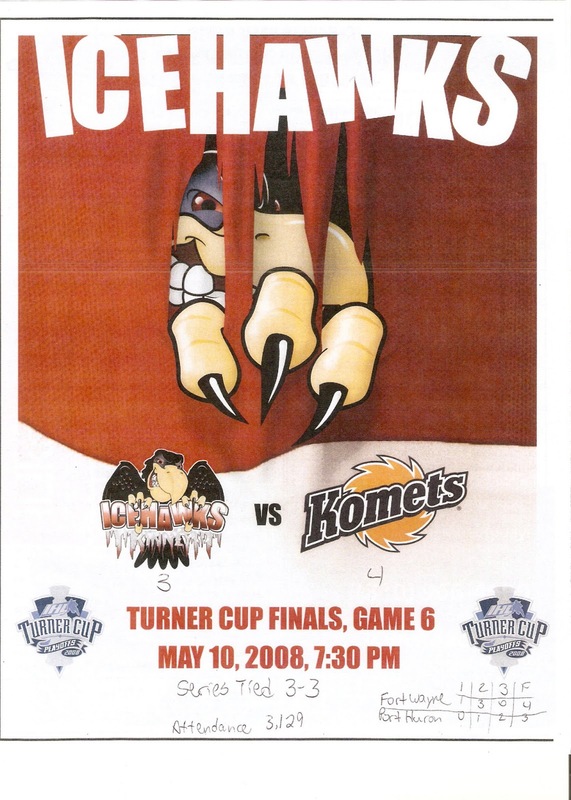 This booklet is from Game 6, which the Komets won, 4-3, in front of a sellout crowd of 3129 at McMorran Arena. I went to all three games in Port Huron, and had a blast. Two of the three games (Games 2 and 6) were city attendance records, and Game 4 drew a respectable (for a weekday) 2500 fans. Coming off a surprise finals run in 2008, the Icehawks improved during the regular season. Stan Drulia's squad finished 44-21-11 in 2008-09, good enough for second place and just five points behind Fort Wayne. The Icehawks were actually in first for the majority of the season before injuries started to mount. Lardner returned to the team and didn't suffer from a sophomore jinx, scoring 37 goals and 65 points. Newcomer Nicklas Lindberg led the team in scoring with 29 goals and 81 points. Jamie Carroll was right behind him with 28 goals and 80 points. A deadline deal brought Steve Rymsha from Flint, and he scored 11 goals and 33 points in 26 games. Veteran NHLer Bryan Smolinski joined the team for the stretch run and added 9 goals and 30 points in 21 games. As a team, the Icehawks scored 262 goals, fourth best in the league. Larry Sterling returned for his first full season between the pipes, and it was a memorable one. After participating in the Red Wings training camp, he came to Port Huron and went 27-15-6 with a 2.68 GAA and 1 shutout. The Icehawks used three other backups, led by Ryan Mior, who went 11-3-5 with a 1.94 GAA and 4 shutouts. As a team, the Icehawks allowed a league-low 201 goals. Despite the slow finish, the Icehawks were favorites to return to the Turner Cup Finals. However, they ran into a hot Muskegon Lumberjacks squad in Round One. Port Huron went down in six games to Muskegon, who would lose to Fort Wayne in the Finals. The Icehawks were named Franchise of the Year, and Stan Drulia won Coach of the Year for the 2008-09 season. Attendance rose a little, but was still a league-worst 1467 per game. This is the yearbook the team sold at the Pro Shop during games. They still gave out scoresheets and game booklets at the door, but kept these in the Pro Shop. I don't know why they didn't try to sell these at the gates like other teams do with programs. It's pretty sharp, 33 pages with articles, player bios and advertisements from local businesses. The Icehawks had another solid season in 2009-10, as Stan Drulia's squad continued to improve in the win column. Port Huron went 47-25-4, and again led the IHL for part of the season before settling for third place, nine points behind Muskegon. Attendance again climbed, but was still a weak 1627 per game, second-worst in the league. Rookie Mikael Bedard led the team in scoring, with 35 goals and 73 points, to win IHL Rookie of the Year honors. Derek Patrosso was right behind him with 30 goals and 70 points. As a team, the Icehawks scored 259 goals, third best in the IHL. Larry Sterling was back in net for the third straight year, and had another solid season. He played in 39 games and went 23-11-1 with a 2.76 GAA and 1 shutout. Adam Russo had nearly identical numbers, going 23-14-3 with a 2.81 GAA and 1 shutout. Rafael D'Orso was a late-season pick-up, making it into one game before being called on to play the majority of the games in the playoffs. As a group, the Icehawks surrendered 223 goals, third-fewest in the league. For the second time in three years, the Icehawks faced the Fort Wayne Komets. And, again, the Icehawks jumped out to a 3-1 series lead. However, an injury to Sterling forced the team to use rookie D'Orso for four of the seven games. Despite his strong play, the Icehawks lost in seven to the Komets, who went on to win their third straight Turner Cup, five games over Flint. 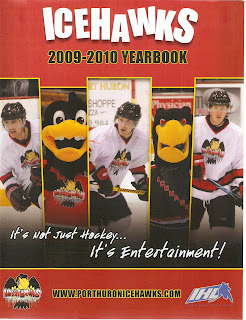 Again, the Icehawks had a yearbook, but kept it safely hidden in the Pro Shop. This one's even smaller than last year's. It's only 24 pages, but includes the necessary player bios, ads and team articles. Not too bad, but they should have tried to sell them at the gates. Any money is good, right? 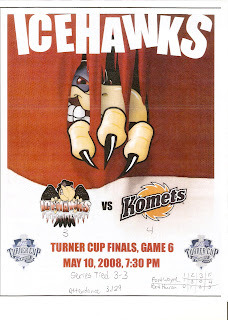 Despite three straight 40+ win seasons and a finals berth in 2008, the Icehawks could never draw enough big crowds to keep the team in the black financially. Having lost about $3 million in three years, the Kinneys decided to suspend operations instead of joining the other IHL teams in the CHL. 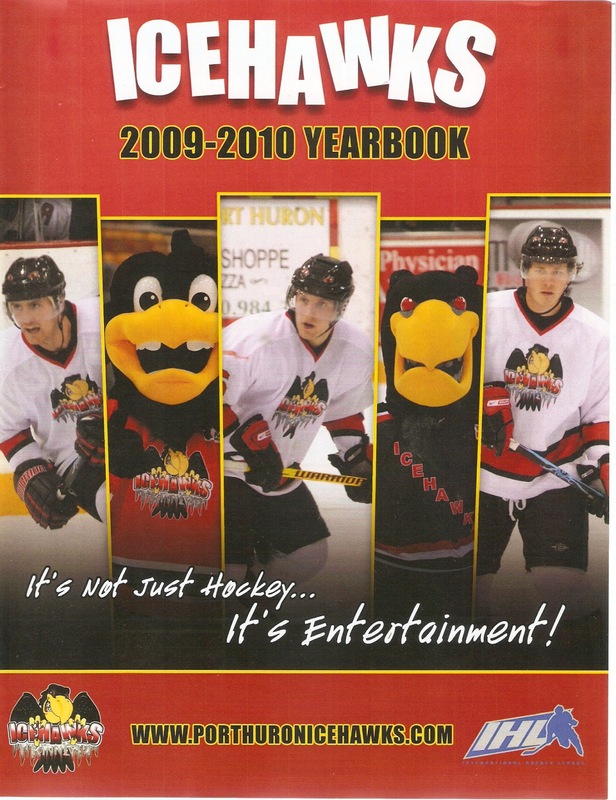 I thought that the Kinneys and the Icehawks were the best chance for pro hockey to succeed again in Port Huron. They were a first-class organization that went all out in promoting their team and bringing an entertaining product to McMorran. However, the damage was done after three failures in the UHL in six years by the time the Icehawks arrived. They'll likely be the last pro team to dare try to play in Port Huron. The crowds are just not there anymore. Shortly after the Icehawks folded, junior hockey arrived on the scene. The NAHL's Port Huron Fighting Falcons have been in town for the past three years, and despite seeing attendance drop to under 1000 per game, will return for the 2013-14 season. Do you know if the 2007-08 team had jerseys with the numbers heat pressed directly to the jersey? I believe they did that season. In 2009, the numbers were sublimated, and in 2010 they were twill. You don't happen to have access to any pictures from that season, do you?